It was Dave Spaulding who gave me the idea, and in fact I bought a gun entirely due to a piece he wrote for our Handguns annual a few years back. The premise was, essentially, if things go to hell and you have time/room to grab only one handgun, what will it be? Dave's advice made a lot of sense (as always), and when my gun fund hit the level that whispered, "Yes, you can buy something," there was no doubt what my purchase would be: a Smith & Wesson Model 629 .44 Magnum with a five-inch barrel. To loosely recap Dave's advice and add my own two cents, the base gun—-a revolver-—is the logical choice for a couple of reasons. One, they're damn near failsafe guns. You don't have to worry about ammo compatibility with regard to function. If it's the right ammo for the gun, and it's not defective, it'll fire. And if it doesn't fire due to some defect, you just pull the trigger again to have a go at a new round. Revolvers don't get finicky due to dirt, dust, lint, whatever. They just keep on trucking. Maintenance? There's no field-stripping (read, no springs or other parts that can get lost), and a drop of lube in the right places is all that's required. And if push comes to shove, you don't even need that—at least for a while. Two, the DA/SA revolver gives you the best of both worlds. In a firefight with a bunch of Mad Max-type characters and need to crank out the rounds? The double-action pull will get the job done. Need more precision for a longer shot at foe or food? Draw back that hammer and use the short, lighter single-action pull. Why did I select the five-inch barrel? I'm a man who believes that compromising is not always a compromise. The four-inch gun is great for carry and even in an N frame can pass muster (albeit barely) as a concealed-carry gun. The six-inch barrel is awesome for its longer sight radius, and the extra weight out front makes the gun more controllable. The five? Best of both worlds. I've got two holsters for this gun, both from Galco. One's a typical belt holster, the other the Kodiak that carries the gun across my front. (And this is the only strike against my barrel-length choice: Both of those holsters had to be ordered as custom because the five-inch isn't a stock item.) 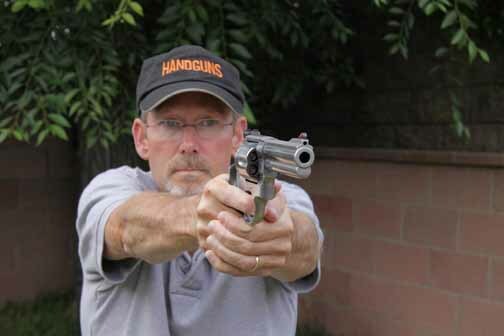 In both carry styles the gun is totally comfortable—something I don't always find with six-inch guns. On the range, I don't feel handicapped taking long shots because I can see the sights better than I can on a four-inch gun. Now for the fun part. Why the .44 Magnum? If there is one gun that can handle any task, it's Elmer Keith's finest creation. Clint Eastwood (well, Dirty Harry anyway) would squint and scowl when I say this, but the real allure isn't that it's "the most powerful handgun in the world"—-which of course it's not. What appeals to me is its older, smaller brother: the .44 Special. You put a cylinder full of .44 Specials in a gun like the 629, and it'll handle defensive tasks like it has since the days of the Wild West. In fact it's so much better now because we have excellent loads such as Hornady's 180-grain XTP round, which is what's currently residing in my 629's cylinder. Eminently controllable and accurate as hell, there's not a two-legged predator that can't be put down with authority with a properly placed shot from a .44 Special. And if you're truly heading for the hills, and the crap has really hit the fan, at some point you're going to run out of the emergency food you've stashed for the occasion. At that point, survival isn't just about avoiding roving bands of thugs but also feeding you and your family. Enter full-power .44 Magnum loads, capable of taking down any game in North America. And it's not just the power but the velocity, which translates to a flatter trajectory and allows you to make shots on spooky food animals at longer ranges than almost any other handgun round. I realize that the whole "head for the hills" thing is mostly just a mental exercise, and I'm not really going to limit myself to one gun (my Springfield XD 9mm is coming with, as are a couple of long guns), but thinking about these things—and acting on them by preparing—makes me sleep better at night.